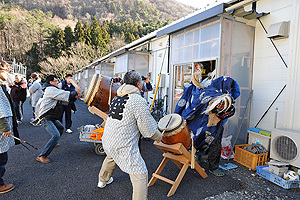 Together with cooperating organizations, the Department of Intangible Cultural Heritage operates the 3/11 Reconstruction Assistance: Intangible Cultural Heritage Information Network [note: the Great East Japan Earthquake struck on March 11, 2011]. The Department of Intangible Cultural Heritage gathers information on intangible cultural heritage in areas stricken by the earthquake and it is involved in providing assistance to restore that heritage. As part of these efforts, the Department of Intangible Cultural Heritage coordinates with the Arts and Culture Consortium for Reconstruction, which consists of the Agency for Cultural Affairs, Japan, arts organizations, and companies. 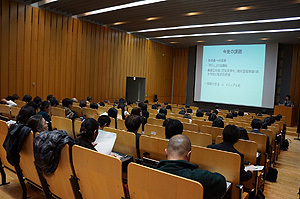 On January 29, 2014, a meeting of the Exploratory Committee on Local Performing Arts Projects was organized by the Consortium in the City of Sendai. The meeting was attended by Hiromichi KUBOTA of the Department of Intangible Cultural Heritage. Since local performing arts (folk performing arts) are a major part of the role that culture and arts play in reconstruction, the Exploratory Committee met to explore future activities in relation to local performing arts. The meeting was attended by representatives from relevant organizations such as the Japan Folk Performing Arts Association, the Association for Corporate Support of the Arts, and the Board of Education of the Town of Otsuchi. Individual proposals were discussed. Three years have now passed since the earthquake, and circumstances related to the restoration of local performing arts are changing. The Exploratory Committee affirmed its intent to develop new approaches to the restoration of those performing arts in light of current circumstances. The Japan Center for International Cooperation in Conservation (JCICC) conducted the 3rd international workshop at the History Museum of Armenia from January 15th–21st and also 5th domestic workshop at the Museum from January 24th–25th. This project was a part of the Networking Core Centers for International Cooperation on Conservation of Cultural Heritage Project commissioned by the Agency for Cultural Affairs, Japan. The attendees gave presentations on the study of Armenian metal objects as well as on the present situation of museums and preventive conservation in their own countries. These seminars helped to exchange of information and establish networks. The seminars were followed by the lectures and the practical training provided by Japanese experts to 7 Armenian experts and 6 experts from the 5 countries such as Georgia, Iraq, Kazakhstan, Kyrgyzstan, and Russia. It lasted for 3 days ending on the 21st. Attendees learned about the environmental control in museums, integrated pest management (IPM), and the methods of materials testing for the exhibition and storage. The domestic workshop for Armenian experts had 7 attendees. Attendees established plans for the exhibition of the metal objects that had been conserved in the previous workshops and they began to prepare for the exhibition. The next workshop will cover the topic of exhibition in museums. Plans are to present the achievement throughout this project by holding the exhibition. The National Research Institute for Cultural Properties, Tokyo has continually surveyed Japanese artworks in collections overseas. However, the fact that there are Japanese artworks in collections in the Caucasus region, a region ranging from the Black Sea to the Caspian Sea, has only recently come to light. 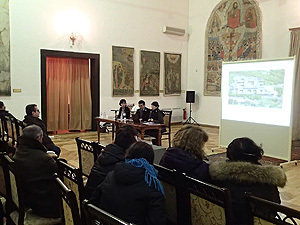 In November 2012, the Japan Center for International Cooperation in Conservation conducted surveys of Japanese artworks in Armenia and Georgia and the Center determined the location of these artworks. The Center deemed that more detailed surveys were needed, so with a grant from the Foundation for Cultural Heritage and Art Research a survey was scheduled for 3 days starting on January 15, 2014. TSUDA Takako, a curator from the Nagoya City Museum, assisted the survey in regard to ukiyo-e (paintings and woodblock prints for popular consumption). 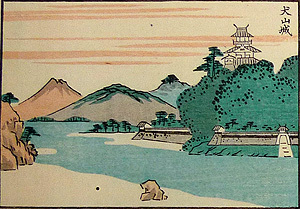 Meiku Shokei in the National Gallery of Armenia (denoted here as the version in Armenia) consists of 29 prints of scenes that are each 8.1 cm high and 11.8 cm wide. As Ms. TSUDA explained, the version in Armenia is based on illustrations from the first volume of Meiku Shoukei, printed from woodblocks and published in 1847. Meiku Shoukei was done by ODAGIRI Shunko, an artist and feudal retainer of the Owari Domain. The work was done entirely by hand, from planning to painting and publishing. The work compiles kanshi (Chinese-style poems), waka (Japanese poems), and haikai (playful poems) that weresolicited from different places and that relate to scenic sites around Nagoya along with original paintings. Authors of the poems are listed at the end of the work. 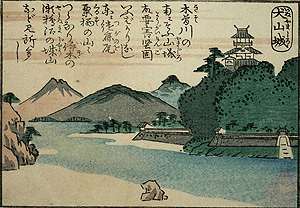 Compared to Meiku Shoukei in the collection of the Nagoya City Museum, the version in Armenia is a revised version of the work that includes explanations of each scene at the top of each print. The version in Armenia was apparently purchased by the National Gallery from an individual collector in 1937, though the work has remained in its collection without any information on its name, artist, or year of production. Interesting questions are how these block prints of famous places ended up in Armenia and how Japanese artworks are received overseas. Plans are to consolidate survey details into a report to help spur future research. 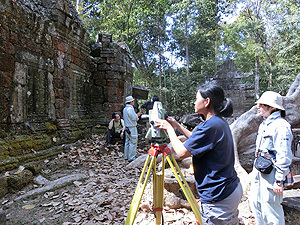 The 4th Training Course in Architectural Surveying at the temple of Ta Nei in Angkor, Cambodia was conducted over about a week from January 17th to 24th. This program began last year, and the 4th training course marks the final course. Trainees were 9 Cambodian young staff members specializing in architecture or archeology from the Authority for the Protection and Management of Angkor and the Region of Siem Reap (ASPARA), the National Authority for Preah Vihear (NAPV), and JAPAN-APSARA Safeguarding Angkor (JASA, a team combining the Japanese Government Team for Safeguarding Angkor and the ASPARA Authority). The topics of the last course were surveys of large trees on the site and photogrammetry. Trainees completed the site plan that had been started during the 1st course, as well as learned new techniques to record various elements of the site as preparation for future site management including creation of risk maps of this site. Using Total Station and dedicated software for photogrammetry to create 3D photo records of walls with carvings and scattered stones. Through these works, we also discussed the topic of how to use this kind of information to manage the site in the future. On the final day of the course, each trainee gave a presentation on his or her findings, and trainees smiled as they received certificates for completing the 2 years program. Ta Nei is one of the important sites in Angkor that has received little intervention until now, and many issues remain regarding the site management. 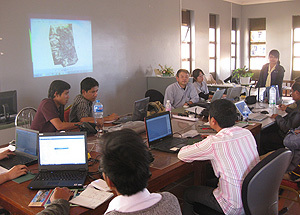 This program has imparted basic survey skills to Cambodian staff managing the site and it represents the first step in helping them preserve the site for future generations. The training courses in architectural surveying are now finished, but plans are to continue providing technical assistance and to continue research exchanges.